Out of drive slots in your computer? Need high-performance external data storage? 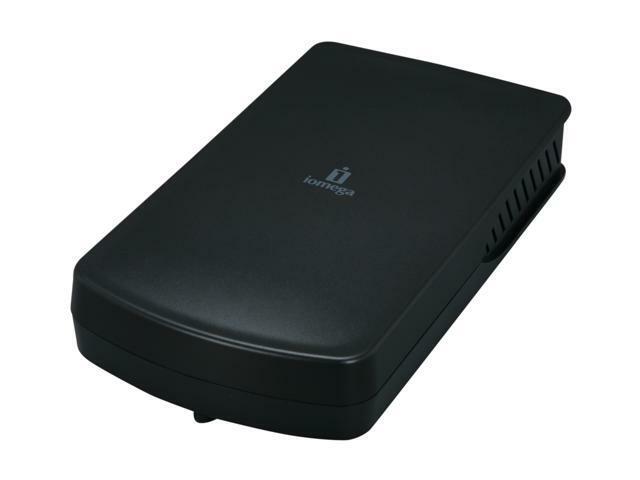 Iomega's got an affordable line of external drives to meet your needs. This 1 TB external hard drive offers the speed and reliability of USB 2.0 connectivity and uses an Energy Star-compliant power adapter to keep things green. Its sturdy case is both stylish and rugged, and takes up less of your valuable desk space. And Iomega is one of the brands you've come to trust over the years. Inexpensive, easy to use, energy-saving; what else could a person ask for? So, if this meets your needs, we'll be happy to sell you a few. 1TB Capacity The Iomega Select 34579 provides a massive 1TB storage capacity, making it the ideal solution for your demanding desktop storage needs. USB 2.0 Interface The Iomega Select 34579 features a USB 2.0 interface for fast transfer speeds of up to 480Mbps and plug-and-play connectivity. Ready to Use out of the Box The Iomega Select 34579 comes with everything you need to get up and running with the inclusion of a USB cable, an Energy Star qualified power adapter and quick start guide. Stylish & Durable - Stylish drive – available in a design Black finish. Energy Efficient - powered by an Energy Star qualified adapter for a better environment! 8.13" x 4.37" x 1.5"
Comments: I opened the thing up and found the hard drive was disconnect with the enclosure, I toyed with it and it started working again. I retract my previous review. Comments: I'll try replacing the USB cord, but I am very pessimistic. Pros: easy to set up. Plug and play. Pros: Price and memory. 1tb for under $70. Works great so far. First external hard drive I've bought. Works great for what I use it for. Cons: A little bulky. The light letting you know it's on is in the back. Power cord and usb cord a little sort. But for the price, who cares? Other Thoughts: I was originally going to get one of the 640gb portable usb powered harddrives mostly for saving music. I saw this one and decided to get it. 1tb for under $70, can't go wrong. Great price for the memory. I've saved music and pics on it so far. Great buy so far. Cons: The device was never recognized by my computer. Tried every usb drive available but nothing. I'm running on Vista with all updated drives and still the hard drive refuses to be recognized even though the LED is perfectly functioning. Other Thoughts: It's weird. Normally there is a warning that something's not gonna work. Either something is rattling or maybe there's a scratch, but no. This drive came out of the box looking like it will work perfectly, but alas it just wasn't meant to be. It raises some questions on quality assurance where a product that should run doesn't at all. Pros: Great price. Fast shipping. Works great. I am using for backing up of my files on windows xp sp3. Low noise level. Other Thoughts: This is my first time dealing with iomega and it is doing great so far. Cons: When I first opened the package the HDD was rattling inside the case. I removed the plastic back to see a large gash on the front of the case (no big deal, it's gonna sit behind the monitor, right?). One of the clips that is supposed to hold the case together is broken and the plastic holes (for where the HDD is supposed to screw to the case to keep it in place) are all broken, leaving the HDD to flop around inside the case. Plugged the case in (waste of time) nothing happens, realize that the board inside doesn't use cables but a straight plug (like is in a laptop) so I have to open the case, remove the screws, and then re attach the HDD to the board and plug everything in hoping that it still works after the HDD appears to have been dropped quite a few times during the manufacturing process. Now all it does it make a buzzing/beeping sound around every 3 seconds. Other Thoughts: I wouldn't have minded the damage, all the drive was going to do was sit behind the monitor for extra storage, but if it doesn't work, I can't exactly use it, now can I?